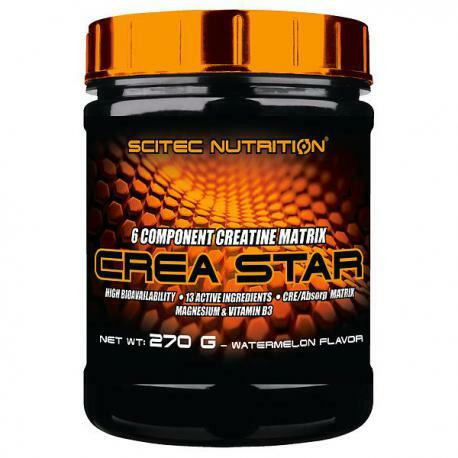 Our novel CREA STAR initiates energy explosions in your muscles with its great Creatine content. 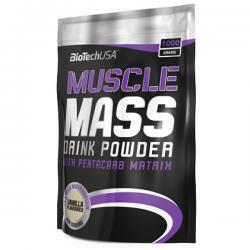 It provides the most popular and most studied Creatine Monohydrate in different forms (e.g. Kre-Alkalyn®, the buffered Creatine Monohydrate) together with other effective Creatine compound. Creatine in this dose (at least 3 grams a day) is scientically proven to increase performance in successive bursts of short-term, high intensity exercise like weight training and intense interval cardio! 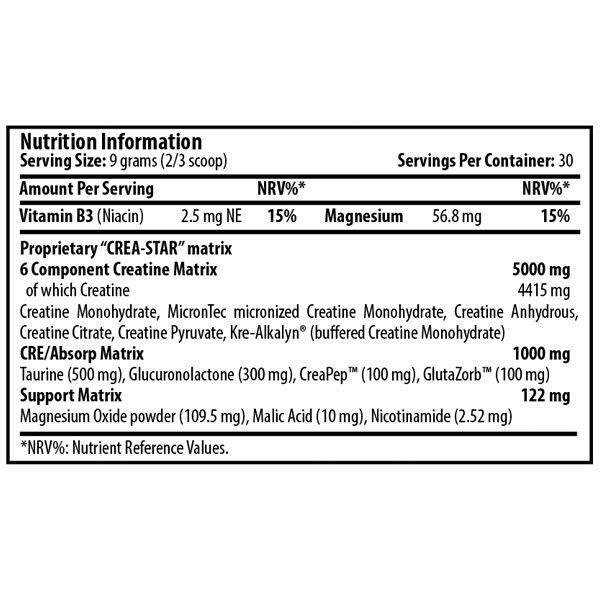 The CRE/Absorp matrix with branded insulin stimulating CreaPep™ Peptides enhances the utilization of Creatine in several ways. In addition to CreaPep™, amino acids also increase insulin secretion leading to a better utilization of Creatine. GlutaZorb™, the stable form of L-Glutamine in solution delivers 100% of this amino into the bloodstream. Glucuronolactone and Taurine are essential for the function of muscle cells and are regular components of energy drinks, ergogenic aids as well. Magnesium contributes to normal protein synthesis, electrolyte balance and maintenance of normal bones and teeth. Magnesium and Vitamin B3 contribute to normal functioning of the nervous system (neurotransmission and muscle contraction including heart muscle), reduction of tiredness and fatigue, normal energy-yielding metabolism and normal psychological function. 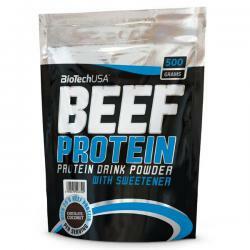 Mix each serving (9 g) with 400 ml water! For a “loading period”, take a serving of CREA STAR for every 15 kg of your bodyweight daily (this way Creatine will saturate your muscles faster). Spread out these servings throughout the day and take them before meals. After 5 days take only 1 serving a day for maintenance. If you wish to forgo a “loading period”, immediately start with 1 serving daily. The product’s Protein Mega Matrix, containing 11 different proteins, is an extremely rich source of protein, which – as part of Muscle Mass's 17% protein content – contributes to maintaining and increasing muscle mass. 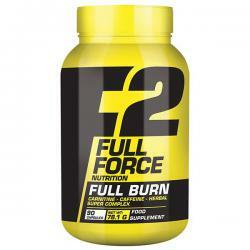 FULL BURN is a “super complex” formula made up of 13 popular ingredients!FULL BURN contains Hydroxycitric Acid (HCA) from Garcinia cambogia extract, and Epigallocatechin Gallate (EGCG) from Green Tea extract. Electroactive contains all the electrolytes: sodium, potassium, chloride, calcium and magnesium. Sodium and potassium contribute to normal neurotransmission, as well as enhance overall bodily hydration. 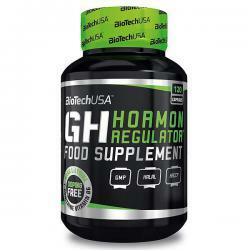 GH Hormone Regulator contains arginine alpha-ketoglutarate (AAKG) and L-ornithine hydrochloride as a source of L-arginine amino acid and L-ornithine, in a ratio of 2:1, respectively. 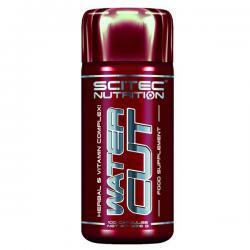 Scitec Nutrition WATER CUT is a complex formula for average people and serious physique competitors as well that may enhance the elimination of excess water! It’s formulated with 8 carefully selected, synergistic herbal extracts and micronutrients.